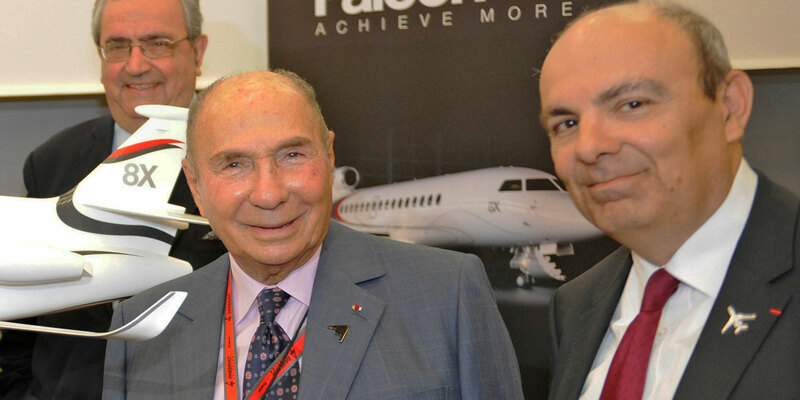 Serge Dassault was here at EBACE in 2014 to help launch Dassault Aviation’s flagship, ultra-long-range Falcon 8X. The aviation community was rocked by news of the passing of Serge Dassault, 93, on Monday, the day before the business aviation community gathered for EBACE 2018 in Geneva. Dassault is believed to have suffered heart failure while at his office in Paris. In 1914, then 22-year-old Marcel Dassault founded the company that would eventually come to dominate French aviation. At that time, he was still named Marcel Bloch, and his successful design of a wooden propeller for World War I pursuit aircraft kicked off one of the greatest success stories in aviation. Serge was born Serge Bloch in Paris on April 4, 1925. He was one of two sons of Marcel (the other being Claude) and his wife, Madeleine (née Minckes). The Bloch family, being of Jewish heritage, was stripped of its property in World War II during the Nazi occupation of France, with Marcel having refused to have anything to do with the German aviation industry. He was deported in 1944 to the Buchenwald concentration camp, then released in April 1945 when the camp was liberated. Marcel subsequently changed the family name to Dassault, his brother Darius's alias when he served in the French underground, derived from "char d'assault," the French term for a battle tank. The young Serge focused on his education, joining the family business in 1951 after graduating from the Institut Superieur de l’Aeronautique et de l’Espace, having previously studied at the Lycée Janson de Sailly and gaining a first degree from the École Polytechnique in Paris. In the early 1960s he added an MBA from HEC Paris. Serge became manager of the Dassault flight test department in 1955 and worked on the development of the Super Mystère B2, Étendard, Mirage III and Mirage IV, among other aircraft. He was then appointed head of exports and led the negotiations that resulted in the sale of the Mirage III fighter to Switzerland and Australia. Serge also launched the Mystère 20 (now Falcon jet) sales campaign in the United States. As Flight Evening News detailed in its May 29 tribute to Serge Dassault at the EBACE 2018 show, Marcel dispatched Serge to the U.S. to investigate the "then burgeoning market for jet transports for business executives." The result was the Mystère 20 twin jet, leveraging the technology of the Mystère IV fighter. The aircraft first flew in 1963 and "impressed an observing delegate from Pan Am [none other than Charles Lindbergh], who wired founder Juan Trippe to say 'I found our bird.'" This was the start of the spectacularly successful Falcon business jet family. Later in 1963 Serge became a senior manager at Électronique Marcel Dassault, where he was appointed CEO on October 1967, holding this position until December 1986. Despite distinguishing himself as a student, Serge’s father Marcel maintained control of the family business and, according to those who remember that time, had little confidence in the young Serge becoming his successor. He did, however, make him head of Dassault Electronique, so that after Marcel’s death in 1986, aged 94, Serge was well placed to become the new leader of Groupe Dassault as chief executive. Serge was soon to prove his mettle as a businessman. Having seen his father Marcel successfully rebuff attempts by President Mitterrand to nationalize Dassault in the 1980s, Serge headed off attempts by President Jacques Chirac to restructure France’s aerospace industry in the mid-1990s, and thus Dassault remained proudly independent. He was instrumental in guiding the development of such iconic aircraft as the Falcon business jet lines and Rafale fighter but also led his company to diversify into other areas, notably acquiring France’s leading newspaper publisher Le Groupe Figaro, in 2004. The company also owns the Paris-based auction house Artcurial and wine estates in Bordeaux–many an aviation executive and journalist has enjoyed Château Dassault’s wines on board the company barge, moored adjacent to its St. Cloud headquarters next to the Seine in Paris. Serge was also active politically as a member of the UMP party, with his son Olivier becoming a deputy in the French National Assembly. Serge himself was a former mayor of the city of Corbeil-Essonnes, a suburb of Paris some 23 miles southeast of St. Cloud, on the Seine. In 2004, Serge became a French senator, championing the position of entrepreneurs struggling against onerous tax and social regulations. In 2000, Serge passed the reins of Dassault Aviation to CEO Charles Edelstenne (Eric Trappier became CEO in 2014) but remained active in the business to the end. Edelstenne will now be considered a leading candidate to take over from Serge in leading Group Dassault. At the time of his death, Serge Dassault was honorary chairman of Groupe Industriel Marcel Dassault, the family’s holding company, which also includes Dassault Systèmes, the leading supplier of the aircraft design and development software (Catia) that is used by the aerospace industry around the world; Sogitec; Lummen; Le Figaro; and SABCA. Serge Dassault married Nicole (née Raffel) on July 5, 1950, and is survived by her and their four children—Laurent, Olivier, Thierry, and Marie-Helene—and several grandchildren. Laurent and Olivier have held executive positions in the family company.